An eclectic exhibition titled “Blind Date” at the Sfeir-Semler Gallery in Karantina gave way to introductions for seven artists who had never before exhibited at the art space. Gallery Director Rana Nasser-Eddin explains, “These are artists that caught our eye. It’s our blind date with the artists and their blind date with the space.” Making their debut, the exhibitors (who hail from various backgrounds including Lebanese, Palestinian, Egyptian, South African and American) each brought a unique energy to the gallery. While the mostly abstract artworks could be ambiguous at first, Nasser-Eddin diligently walks visitors through the exhibition to reveal the depths of each piece and processes of the artists. Two of the works on display are highly political. 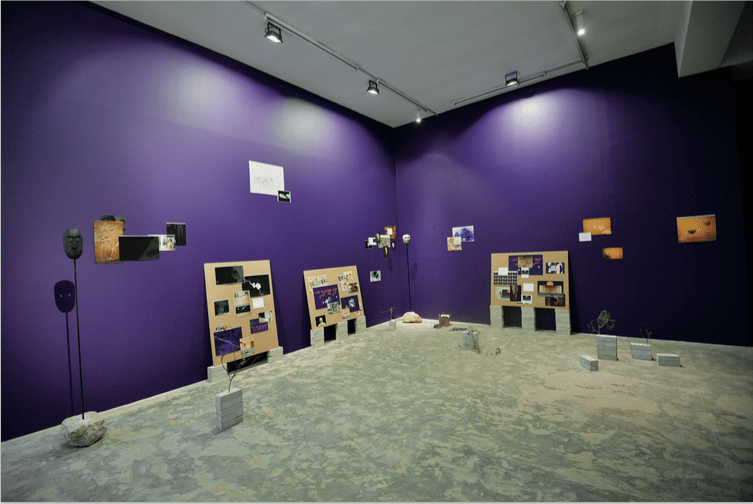 Like many contemporary artists, Lebanon’s Lawrence Abu Hamdan strongly believes art and politics can’t be separated, and his piece “Conflicted Phonemes” appears more like a linguistic analysis than the traditional notion of art. Abu Hamdan uses scientific data from Dutch immigration to analyze how Somali refugees’ dialects essentially determine whether their applications for asylum are accepted or rejected. In the controversial practice, refugee speech is analyzed to determine what part of their country they are from. Applicants stand a higher chance of being denied asylum if they seem to come from areas that are immediately affected by conflict. The artist extracts, conceptualizes and maps language sounds, looking at their inherent politics and exploring the nature of accents. “It’s a reflection of how a sound can essentially deny a right for someone,” explains Nasser-Eddin. While Abu Hamdan’s work looks at science from a political perspective, Palestinian artists Basel Abbas and Ruanne Abou-Rahme, who work as a pair, consider a more psychological aspect of politics. They address their trauma as Palestinians through their installation, which includes various elements hung on walls and others scattered on the floor as well as a documentary film. The story behind “And Yet My Mask is Powerful” is powerful indeed. It follows the pair’s research journey to understand the world’s oldest Neolithic masks, found on Palestinian land and seized by the Israeli state, which the artists are now reclaiming as Palestinian. The historic masks were appropriated and exhibited at The Israel Museum and around the world, although they actually come from Palestinian villages. For the installation, Abbas and Abou-Rahme use photos, plants, replicas of the masks, a poem by Adrienne Rich and even cement – symbolic in its recalling of Israeli settlements, the West Bank wall, Palestinian building customs and more. Meanwhile, the documentary looks at the towns from which the masks originate. The project thus creates a counter-narrative that reclaims these historical relics as Palestinian by sharing their story. Storytelling is also present in emerging Egyptian artist Mohamed Monaiseer’s art, which pays tribute to traditional fables, revisited in a contemporary context. A series of artworks first painted on fabric from an old bed and then embroidered replicate a traditional way of illustrating stories, evoking myths like those of Calila e Dimna. His other artwork in the exhibition features a suspended shroud-like piece that’s covered in what Nasser-Eddin describes as “heightened calligraphy,” a calligraphy-like script that doesn’t actually have any words. On the other hand, the work of Ania Soliman, who was born in Poland and grew up between Iraq, Egypt, Europe and the U.S, is very scientific, mostly focusing on how the digital world is incorporated into our lives. 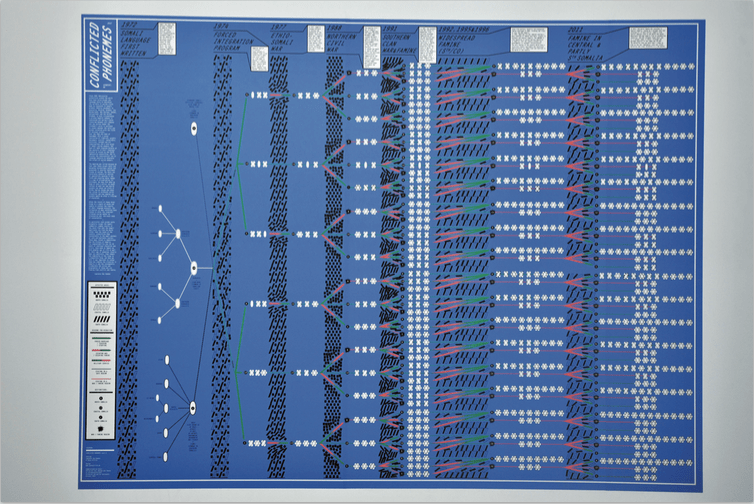 Her piece titled “Explaining Dance to a Machine” depicts a digitized dance notation from the 1920s. To a trained dancer, the notations are recognizable patterns one follows during a dance routine, similar to how a musician reads musical notes. 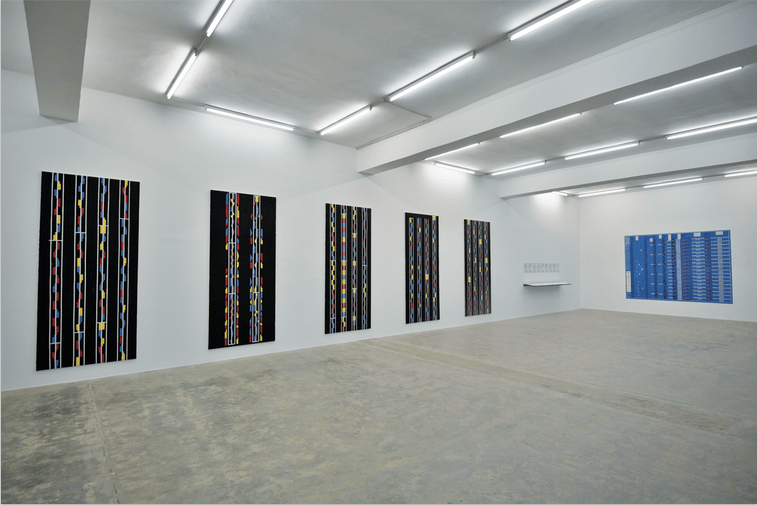 Her large, geometric paintings, mostly in primary colors, turn the back and forths of human movement in dance into something that is computerized and structured. Yet because the painting was done by hand it retains its humanness through its flaws. Dineo Seshee Bopape from South Africa works across various themes in her art, including politics, race, spirituality, gender and sexuality. The elaborate structures in her installation, “Sedibeng (It Comes With the Rain),” include abstract figures and charms, as well as herbs traditionally associated with healing female health problems and a plethora of flowers found in South Africa. She manipulates the space using mirrors, light and shadows, and uses sounds and a slideshow to affect the viewer with an onslaught of sensory data. 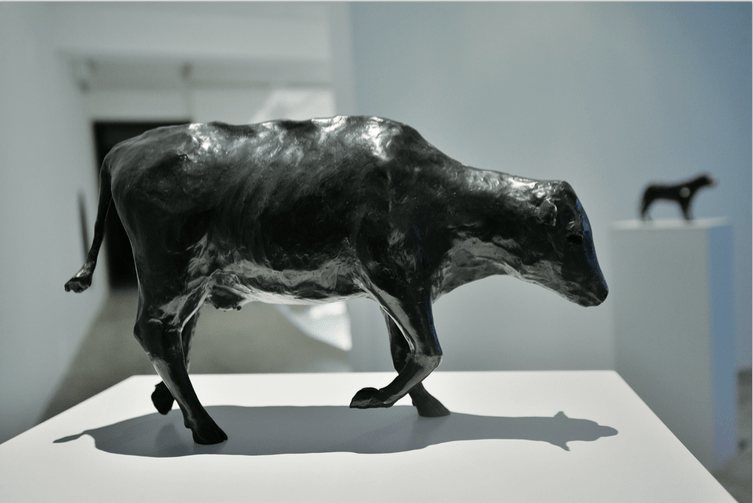 Also looking at nature, American filmmaker and animator Joshua Mosley’s work looks at the human relationship with nature through a film and bronze sculptures replicating those used in the film. Using the difficult and time-consuming stop-motion animation technique, the film stars models of French philosophers Jean-Jacque Rousseau and Blaise Pascal, as well as several animals, who discuss the human condition in a forest. The exhibition is ongoing until March 25 at Sfeir-Semler Gallery, Karantina.